With winter finally on the way out, it’s time to welcome spring. But what if your hometown still has more frost than flowers? Not a problem! Just start packing for spring break. Even if you haven’t made spring break plans, it’s not too late to plan a road trip with friends or even a staycation with family (you’d be amazed at what a night away at a hotel with a pool can do for your spirits). But let’s just say you have a flight to a tropical destination in your future. The key is to bring only the essentials because the less you pack, the quicker you can get to the beach once you land. Plus, what more do you need on spring break besides a great swimsuit, chic sandals & a colorful maxi that takes you from day to night? 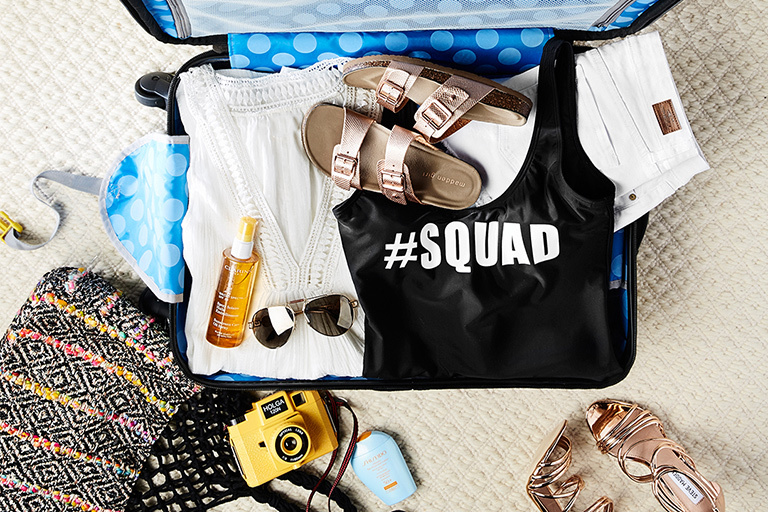 You’re going to have to pack all your spring break essentials in something, so why not make it bright, fun and something that will never get lost on a conveyor belt? Our go-to luggage is from my favorite artist, Romero Britto. Choose a flattering one piece in black with pops of color in the center to minimize the midriff. A halter top also gives you the most options to avoid those undesirable tan lines. A great choice is a flowy maxi dress that you can slip on over your swimsuit for lunch by the pool, but can also pair with heels for a night out on the town. True beauty begins with great skin, which means protecting it when you’re in the sun. Try Clarins sunscreen lotion spray. Anytime you can find a sandal that looks cute with your swimsuit, but can also give you the height needed for dinner in your maxi dress, you’ve found a winner. I’m particularly a fan of these cork wedges. Sure, you’re going to want to bring a few other extras (like toothpaste and underwear), but if we’re really going to be honest, you know you’ll be spending 90% of your time in my picks above.